Ride through New Zealand roadscapes that most motorcyclists only dream of, take on the Rimutuka Ranges, Milford Road, Lewis and Lindis Pass. There is a reason Haast Pass is called "Motorcycle Heaven", most cameras can't capture its beauty, and the road is incredible to ride! If you like to do things properly, and don't want to miss out on anything that New Zealand has to offer then this is the guided motorbike tour for you. Auckland to Hokianga 274km: From Auckland, ride along the edge of the Tasman Sea, up the West Coast and through the Waipoua forest. This forest is home to ancient kauri trees, like 'Tane Mahuta' - the King of the Forest in Maori folklore, that are over 50 metres tall. Spend the night on the edge of the remote and unspoiled Hokianga Harbour, with views of the 300m high sand dunes across the harbour. Hokianga to Paihia, the heart of the Bay of Islands 210km: We take the tiny car ferry across the Hokianga harbour and ride the traffic free roads of Northland. This afternoon, explore historic Russell Kororareka, the first capital of New Zealand. Paihia to Auckland 227km: Head south, hugging the coastline and enjoying views of the Pacific Ocean, before turning inland and riding through Auckland, the 'City of Sails'. Auckland to The Coromandel 210km: We ride south out of the city across rolling green country side to the Coromandel Peninsular - an area of outstanding natural beauty and fantastic biking roads. Every corner reveals a stunning view across native forest, rugged hills and blue sea. Coromandel to Rotorua 250km: Ride the circuit around the Coromandel Peninsular and have lunch in Coromandel township. See bush clad hills and enjoy stunning views of the coastline. On the way to Tauranga, take on the Karangahake Gorge, one of the most scenic rides in the North Island. Then head to Rotorua, the geothermal hotspot of New Zealand. Free day in Rotorua: See boiling mud and geysers at Whakarewarewa Maori village. Visit the Agrodome, take a gondola and ride and try the luge, fly to White Island an active volcano or discover what zorbing is. A Maori cultural show and hangi feast is arranged for the evening with a chance to see our national bird - the Kiwi! Napier to Wellington 320km: Continue south, through vineyard country and see Hawkes Bay's orchards. Ride over the winding Rimutakas, just north of Wellington where pretty houses cling to the hillsides overlooking Wellington Harbour. Explore the capital city and see the 'Beehive' - New Zealand's government building and visit the fabulous Te Papa Museum. Wellington to Nelson 110km: Cross Cook Strait by ferry, and ride the Marlborough Sounds iconic roadway - Queen Charlotte Drive. Follow the road through dense pine forests to Nelson, Australasia's largest fishing port with its unique microclimate. Nelson has the highest number of sunshine hours in the country and is known for its art and culture. Nelson to Hanmer Springs 310km: Ride south over Mt Hope Saddle and through the Buller Gorge. Stop for lunch at the old gold mining town of Murchison, then ride the famous Lewis Pass with its world-class mountain scenery. Hanmer Springs to Punakaiki 258km: Another chance to ride the spectacular Lewis Pass - a fantastic scenic ride and an old Maori greenstone trail. Stop at Reefton, a historic gold mining town for lunch then head to Punakaiki on the wild West Coast. See Pancake Rocks, incredible rock formations and blowholes were 30 million years in the making. Punakaiki to Fox Glacier 213km: The West Coast road looks towards the Tasman Sea on the right and Southern Alps on the left. The road winds it's way through native rainforest as we approach Fox, excellent and exciting riding! The glaciers are an awe inspiring sceptical, amazing seen from the ground, and even more stunning from above. A helicopter can take you on a trip you'll never forget! Fox Glacier to Queenstown 352km: Today you'll experience rainforest, stunning coastline, mountain passes and crystal clear lakes! We ride north along the Pacific coastline, then turn inland and take on Haast Pass - renowned as 'The best motorcycling in the world'. We head to Wanaka then over the Crown Range - the highest sealed road in New Zealand - to spend two nights in Queenstown. Explore Queenstown: Paragliding, jet boating, bungee jumping and white water rafting are just a few of the adventure activities that you can try in Queenstown. Or, you could take a ride alongside Lake Wakatipu to Glenorchy, visit a vineyard, or explore Arrowtown; a historic gold mining town full of cafes, art galleries and location of many scenes from Lord Of the Rings . Queenstown to Te Anau 170km: Take a short, but stunning ride to Te Anau and see Fiordland's primeval landscapes. This is one of the few places on the planet the wilderness is still pristine. Waterfalls tumble hundreds of metres into forested valleys, the mirror surfaces of the fiords reflect the majestic towering mountains the word 'silence' takes on a different meaning. Te Anau to Milford Sound to Te Anau 110km each way: Ride along the shores of Lake Te Anau, through the famous Homer tunnel, and down to Milford Sound. The mountainous views on the road to Milford are almost as impressive as the Fiord itself. Keep an eye out for kea, a cheeky alpine parrot with a taste for rubber and plastic. Your cruise on Milford Sound is included. 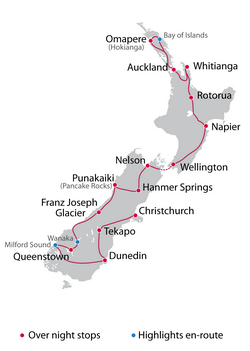 Te Anau to Dunedin 320km: Today's route is a curvaceous ride that winds through central Otago, to the very Scottish city of Dunedin. Victorian architecture and the divine Otago Peninsula makes this a particularly attractive place to visit. We pass through the fly-fishing capital of New Zealand - Gore where we stop for lunch and visit a fascinating vintage aircraft museum and workshop. Free day to explore Dunedin: Dunedin is the heritage and wilderness capital of New Zealand. You can choose to explore the city or ride out to the Otago Peninsula to visit the royal albatross and yellow-eyed penguins. The Peninsula has winding roads with stunning coastal views, while the city has historic buildings, museums and art galleries waiting to be explored. Dunedin to Tekapo 416km: Our route takes us through central Otago to our fruit growing centre of New Zealand and along the shores of Lake Dunstan. The scenery changes dramatically as we ride the Lindis pass to Lake Tekapo. This is the largest of the three lakes in the McKenzie Basin and offers breathtaking views of Mt Cook Aoraki - New Zealand's tallest mountain. At the Church of the Good Shepherd, admire the famous bronze statue of a sheep dog and views of the turquoise lake. Tekapo to Christchurch 263km: Mackenzie Country is dramatic, its vast landscape punctuated by stunning glacial lakes and the bold man-made canal system which produce hydro-generated energy. Were now on the scenic route to Mount Hutt, the main skiing area for residents of Christchurch. Admire the views at Rakaia Gorge Bridge, high above the river an ancient Maori greenstone (jade) trail. Continue through the lush farmland of Canterbury to Christchurch, the most English New Zealand city, built around the picturesque Avon River and renowned for its wonderful gardens. Tonight we have our farewell dinner - you'll have made many friends and have memories to last a life time!